The music festival previously took a hiatus in 2017 due to limited headliner availability. That year they also cited the competition of numerous Canada 150 events in Canada as a challenge. The festival returned last year with headliners Brian Wilson, X Ambassadors and Social Distortion. Rock The Shores debuted as a one day concert featuring The Tragically Hip with Sam Roberts and locals Current Swell and Jets Overhead. The first year had a number of growing pains including long lines, a beer shortage, and a lightning storm. In 2013 the festival expended to two days with marquee headliners Weezer and City and Colour. Weezer would later release the audio recording of their set to purchase. It also featured a rare encore for an opening act by Reignwolf and an online tirade by Matthew Good after his performance. In 2014 the festival would expand again to three days with Tom Cochrane with Red Rider, Billy Talent and Our Lady Peace headlining. Gord Downie also returned with his side band, The Sadies. 2015 saw the festival go back to a two-day format with powerhouse headliners The Black Keys and Jane’s Addiction. Their inclusion was part of a talent sharing agreement with the Pemberton Music Festival. 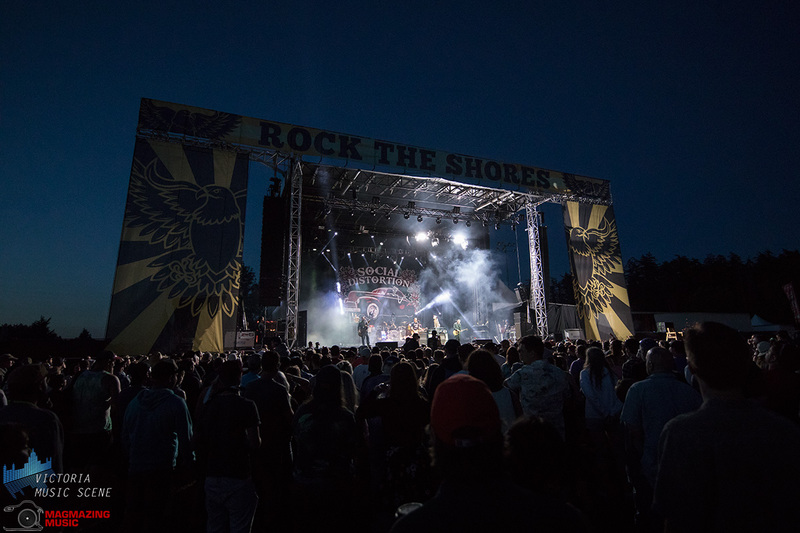 Rock The Shores returned to a three-day format in 2016, this time with the first day featuring all Vancouver Island acts headlined by Current Swell. The other two days featured City and Colour and Metric at the top of the bill with Arkells, Eagles of Death Metal, The Cat Empire, July Talk and The New Pornographers in support. 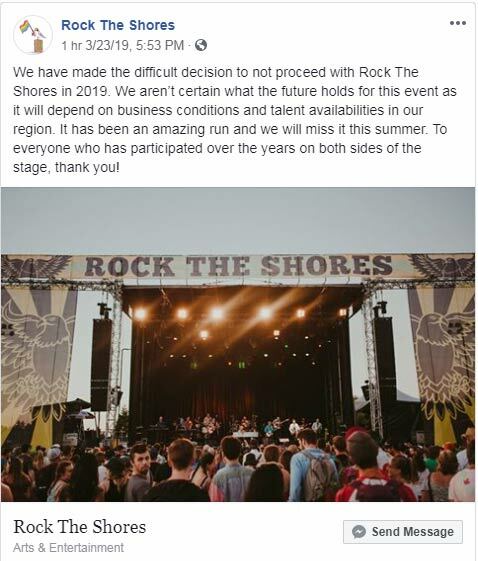 We have made the difficult decision to not proceed with Rock The Shores in 2019. We aren’t certain what the future holds for this event as it will depend on business conditions and talent availabilities in our region. It has been an amazing run and we will miss it this summer. To everyone who has participated over the years on both sides of the stage, thank you!